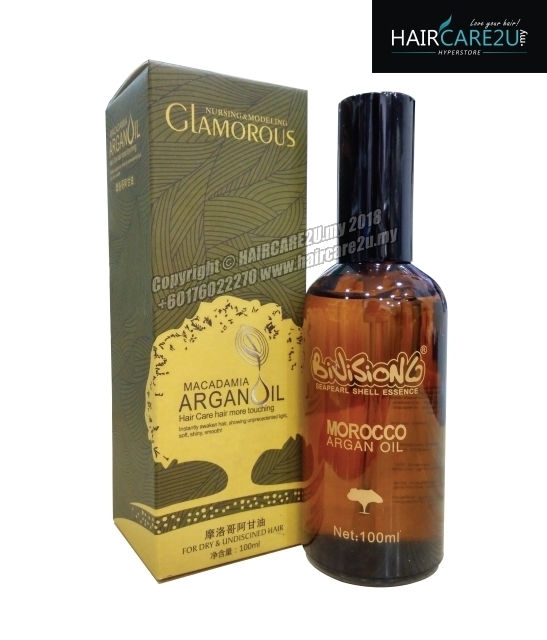 Glamorous Morocco Argan Oil protects while nourished stressed and aged hair. Leaving extra care for dry or brittle hair with its natural shine enhancer which extracted from organic Argan Oil. This product contains high composition of Omega-6 and Vitamin-E. It gives new life to dry, tangled and flyaway hair with its instant absorption and non-greasy effect. Apply a few drops to the palm and rub hands together, evenly distribute throughout on damp hair for getting better results. Perfect treatment before and after blow drying or heat drying. You have probably heard about the many great things about Argan Oil. It has been currently termed as the Miracle Oil since it has a lot of benefits when it comes to beauty and health. This oil is being extracted from the Argan fruit through crushing its fruit and squishing the fruit. This oil is currently replacing a lot of natural oils and other products when it comes to hair treatment and protection. This product is currently in demand because of the many benefits that it has however the supply is limited. A person will be able to benefit a lot from this oil since it can help make your hair look good. It was mentioned above that this product is in demand because of the many beauty benefits that you can acquire for your hair. Many experts all over the world call this product as the “liquid gold” since it can give a new life to the dry and fly away hair. It works similar to the properties of the also famous “Jojoba Oil” that is also known to be a product that deals well with damaged hair. Below are the common and obvious effects of Argan Oil on the human hair. 1) The argan oil is able to help hydrate the hair in a natural way. It is able to stop the fly away of hair, the curliness and also the roughness of the hair in a natural and efficient way. 2) The argan oil is also able to penetrate the pores of the hair follicles and shaft and thus is able to enhance the elasticity of the hair. With this penetration, it is also able to help in the nourishing of the hair. 3) The argan oil is also famous for treating damaged hair by being able to help in controlling unmanageable hair. 4) The argan oil contains a lot of natural anti-oxidants that will help strengthen the weakened hair strands. 5) The argan oil is also a good natural source of Vitamin E thus it is chosen by many experts to treat damaged hair. Some hair experts also use argan oil incorporated in many hair treatment products. The vitamin E found in argan oil is also very helpful in treating and repairing damaged hair strands that are due to the effects of environmental factors such as the sun’s rays and pollution. 6) You can also use argan oil to add shine to your hair and is able to restore the natural luster and beautiful shine of your hair. 7) If you had a color treatment on your hair, applying this product will help you remove the brittleness of the hair and restore its natural smoothness. 8) For those who love to treat and have their hair styled very often, this product will definitely help in the repair and restoration of damaged hair due to styling. 9) This argan oil is also rich in omega 3 and 9 fatty acids that will help in the healing of split ends.